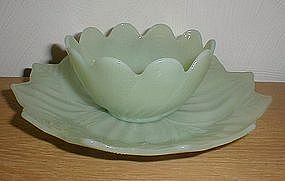 Fire King Jadeite Leaf & Blossom Sets, all pieces in excellent/mint condition with no damage and all the original shine. Five sets are available. Ten amber Parrot Sherbets, all in excellent/mint condition with no damage or use marks. $20 for one or two for $35. 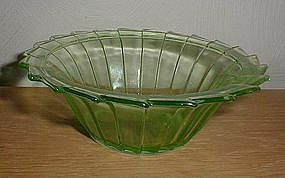 Green Sierra 5 1/2" Cereal Bowls in excellent condition with no nicks, chips or cracks. 4 are available. 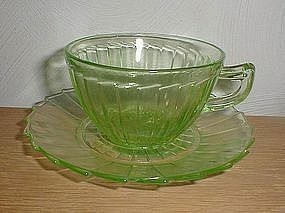 Green Sierra Cups and Saucers in excellent condition with no nicks, chips or cracks. Two sets are available. $20.00 for one set or $35.00 for both. 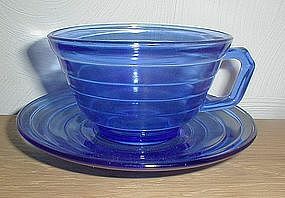 Cobalt Moderntone Cups & Saucers in excellent/mint condition with no damage or use marks. 5 sets are available. $12 for one set, $10 each for two or three. 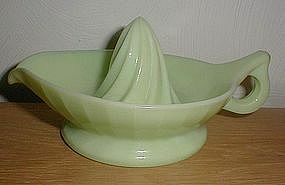 Jeannette jadeite Lemon Reamer in mint/unused condition. Had been stored in an attic and wrapped in 1935 newspaper until a few weeks ago. 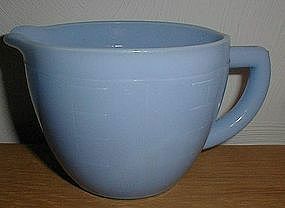 Delphite Jeannette 2 cup measuring pitcher in excellent condition with no damage or use marks. Has the Jeannette sunflower base. 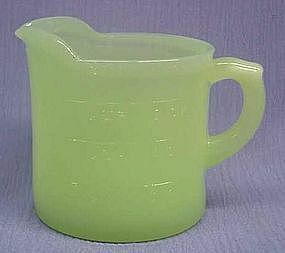 Hocking Glass, Clambroth green 1 cup measuring cups in excellent/mint condition with no damage or use marks. Two are available. 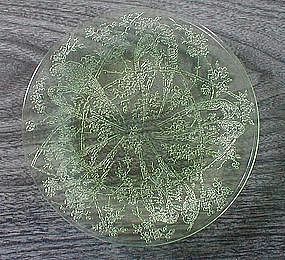 Listed in Gene Florence's Kitchen Glass Book at $250 - 275 each. These are priced at $225 for one or $425 for both. 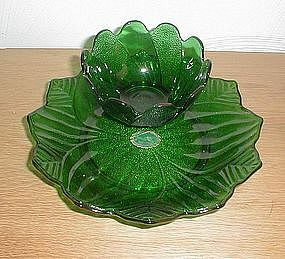 Fire King Forest Green Leaf & Blossom Set in excellent/mint condition with no damage or use marks, and the original label on the "plate". 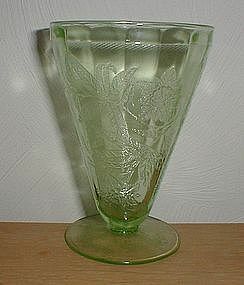 Green 8 3/8" Parrot pattern plates made by Indiana Glass in the 1930 time area. 6 are available and all are in excellent condition with no damage or use marks. $30 for one or $25 each on orders of two or more. Two Hazel Atlas Robin Hood green decal mugs, both in excellent/possibly unused condition with no damage or use marks. $25 for one, $45 for two. 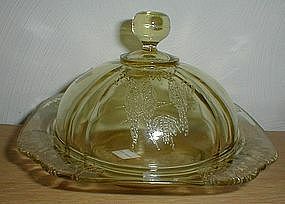 According to Gene Florence, there are only two MINT condition amber Parrot Butter Dishes known to exist. This is one of them. I purchased this from Gene some time ago and have decided it doesn't really fit with my collection. It still has his "Grannie Bear" stickers on it. 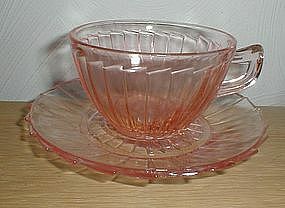 Pink Sierra Cups & Saucers in excellent condition with no damage or use marks. Four sets are available. $23 for one set or $20 per set on orders of two or more sets. Green Floral/Poinsettia 4 3/4" 7 oz. Footed Water Tumblers in excellent condition with no damage or use marks. 5 are available. $25 for one or $45 for two. 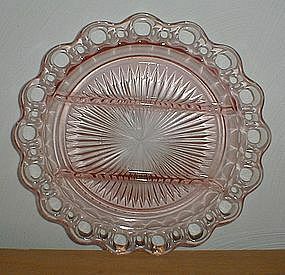 Pink Old Colony / Lace Edge / Open Lace 10 1/2" 3 Part round Relish Dish in excellent condition with no nicks, chips or cracks, especially on the lace edging. 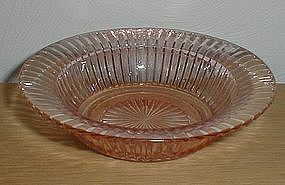 Pink Old Colony, Lace Edge, 10 1/2" 3 Legged Bowl in excellent condition with no nicks, chips or cracks especially on the lace edging. 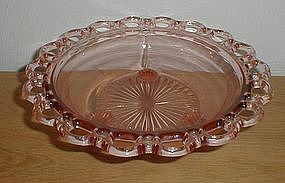 Pink Queen Mary 6" Cereal Bowls in excellent condition with no nicks, chips, cracks or scratches. 3 are available. $12 for one or $30 for all three. 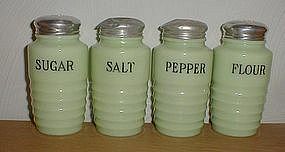 Very nice set of Jeannette, ribbed Shakers - Salt, Pepper, Sugar & Flour. Shakers are in great shape with no damage and real nice lettering. Salt & Pepper lids have some denting, Sugar & Flour lids are really nice.